My family and I walked through the door of the classiest restaurant in the heart of downtown Chicago. We sat down and looked at the menu, and I already wanted to leave. The black print filled the menu with unfamiliar names until I saw the shining star in the bottom corner: chicken fingers. I found comfort in the fact even the upper class see the value of my favorite food. Each member of my family ordered their healthy, hip meals. When I finally said my order, everyone’s heads turned. It was easy to see the disgust on my brothers’ faces from across the table. The rest of the trip, I received little comments about how picky I am. Finally, after months of being called a picky eater from my brothers, I grew up. People who are still in the chicken finger habit need to grow up too. Many West Ottawa students are proud chicken finger people. Most American restaurants offer the chicken finger platter, so it satisfies these people. But is this necessary? Should society allow chicken finger people? Absolutely not. To all the chicken finger people out there, it is time to grow up. There is also the possibility that one might come to like the foods they once loathed. But how will they ever know if they refuse to try? More problems emerge in adulthood. Nothing is less professional than ordering chicken fingers with a boss or coworker. It’s just childish and shows a sense of indecisiveness and inability to try new things. This should be an obvious motivation for chicken finger people. The time is now to expand food horizons and save the embarrassment. Why not grow up sooner rather than later? 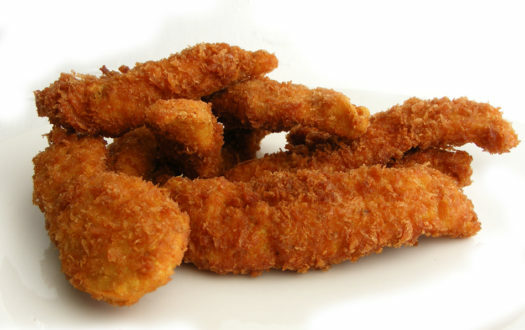 Chicken finger people are quick to defend their food habits and act as if there are no alternatives. “It’s either I am picky and starve or I force myself to eat food I don’t like,” Sr. Keagan Cano said. Cano scarcely eats at her boyfriend’s house in fear of the possibility of not liking the food and then hurting someone’s feelings by expressing her dislike. This is not a way to go through life. Picky eaters need to stop letting their food control their lives and happiness. Being a chicken finger person sometimes isn’t peoples’ fault; many teenagers were raised in a household with busy parents or parents who know their child is a picky eater and do not push them to try something new. “My mom and dad were always very busy on weekdays and there just wasn’t enough hours in the day to make a fancy meal. So, pizza or chicken was easier to do when they got home,” Sr. Ryleigh Hyma said. Once you become a teenager, you get your own choice of food and have the chance to cook for yourself. Perhaps the reason many teens stick to the safe choices is in part because of laziness. Now is the critical time to change. So grow up and take control of what you put into your body because chicken and pizza is not a healthy choice. To all the chicken finger people, it is time to move on. Get out of your shell and order something else for once. You are soon going to be an adult, and your food choices should reflect this.